Can A Pretty Smile Improve Your Social Life?? | Robert S. Minch, D.D.S., P.A. We just finished a case that I am so thrilled with. Al is a 70 year old patient that we have been seeing for years. His wife passed away several years ago and he mentioned, at his last cleaning appointment, how he wanted to get back into the dating game and could we improve the looks of his front teeth. Together, we decided on porcelain veneers on his upper front 6 teeth and a little cosmetic bonding on the lower front teeth. The process for making porcelain veneers is comprised of 2 appointments- the first appointment is to prepare the teeth and make temporaries that creates the “look” that the patient desires and get as close to the projected outcome as possible. After that appointment, the patient wears the temporaries for several weeks while the lab makes the final veneers. The second appointment is where the temporaries come off and the final veneers are bonded in. With Al, the first appointment went very smoothly and he loved the temporary veneers. 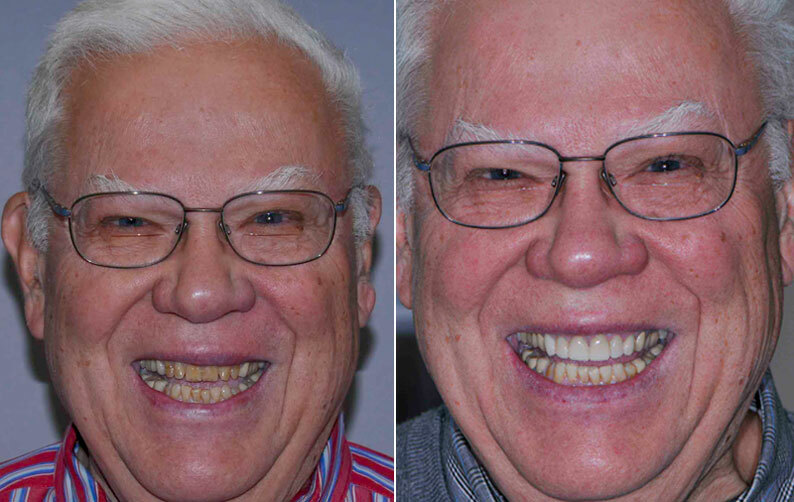 When he came back for the final veneer bonding appointment, he was grinning from ear to ear. He couldn’t wait to share his good news—- Soon after the initial “making temporaries” appointment, he met a woman and they really hit it off. His new girlfriend loves his smile and Al credits his new teeth with his immediate success in the dating world. Talk about immediate success!! I guess a pretty smile actually can improve your social life!! !